After years of build-up, Marvel Entertainment has finally delivered The Avengers unto us. In the capable hands of writer/director Joss Whedon, it balances the snark of Tony Stark (Robert Downey, Jr.), the old-fashioned uprightness of Steve Rogers (Chris Evans) and the nobility of Thor (Chris Hemsworth). And oh, yes – Hulk (Mark Ruffalo) will smash. In short, as audience members, we have nothing to avenge. The summer movie season has begun and it has begun well. Whedon delivers a film that walks a delicate tightrope. 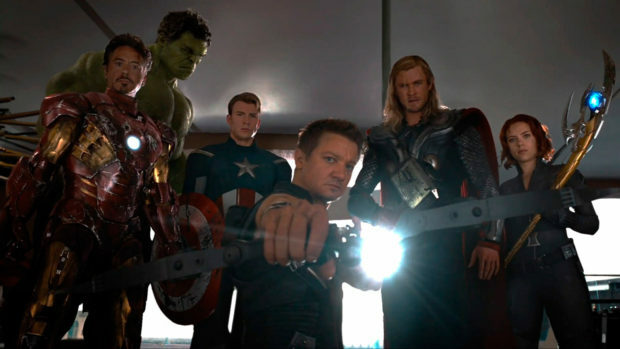 Too many characters could easily overburden a summer blockbuster, and yes, Marvel’s The Avengers is stuffed with superheroes plus a lurking Nick Fury. But nobody feels undeveloped, perhaps thanks to the economy of Whedon’s scripting. That’s no small feat considering that in addition to the four heavy-hitting headliners, Whedon reintroduces Black Widow (Scarlett Johansson) and Hawkeye (Jeremy Renner). The Widow essentially gets rebooted after a bobbled appearance in Iron Man 2, with veiled hints at a back story that ties her to Hawkeye. Neither get true origin sequences, but neither needs to. Instead, their actions, their attitudes and their tossed-off comments fill in the lines of fully realized characters. Remarkably, Whedon also manages to pull five separate franchises forward. By the end ofMarvel’s The Avengers, all of the headliners have moved forward emotionally to spin back into their own movies (which, of course, are happening). If reports are to be believed, Marvel even wants to go back to the Hulk well one more time with Ruffalo. Yet it stands on its own. Loki (Tom Hiddleston) returns from the cosmos to wreak havoc on the earth. Even if you haven’t seen Thor, the horned helmet and the alien co-conspirators from the beginning should tip you off that he’s a bad guy. Occasionally characters reference the earlier films, but more in terms of characterization than plot having strong bearing. What matters is the action here. And Whedon delivers, giving us battles and set pieces that get nice contrasts with actual character work and interaction. To some extent, he even nods to SHIELD’s origins as a way to capture the Bond craze – we get an underground base and the signature helicarrier, brought to impressive life on film for the first time. For SHIELD we also get Nick Fury (Samuel L. Jackson) at his most manipulative, yet Jackson still conveys the character’s fundamental decency. He will always be the outsider, out of necessity, and may get the shortest shrift of them all. Fury’s secrets will have to wait for his own film. Again, that’s the way it should be. While we get a snapshot of each character’s emotional arc, the solo films are where those should be carried. Here, it’s about how they all get along – or not. And those quieter conversational scenes, crackling with Whedon’s wit, finally capture on film those moments that really hold hard-core comics fans to the books. The action may be attractive, but it’s the interaction that cements us. With this film, Marvel Studios also seems to be moving towards embracing its four color source material. 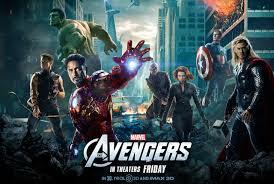 Elements pop up here that firmly move The Avengers into being patently, but entertainingly, unrealistic. While Tony Stark donning the armor in Iron Man might not exactly be possible, it’s still quite a jump from fighting terrorists and corporate espionage to Loki and the Chitari from outer space. For a paragraph, I may have veered too deeply into fandom, and admittedly, The Avengers has moments of doing that, too. But they are not so obscure or so important that they leave any non-comics fan out in the cold. It’s solid entertainment that may break new ground for the superhero movie. Or at least make a marvelous amount of money.